Gunpowder on the Teeth: Arcade, from Gunpowder Team, is a greyscale run-and-gun action platformer with hints of Metal Slug and Broforce. You begin the game with a single soldier, but you unlock several more during the course of the game, each with his own secondary explosive weapons, allowing them to unleash grenades, mortars, and missiles on top of to spraying machine gun fire and planting bombs. 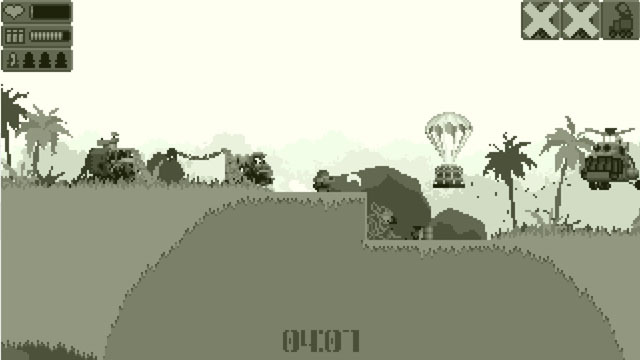 In addition to soldiers, the player must contend with environmental hazards in the form of bottomless pits, patches of razor wire, and land mines for those who enjoy punishing difficulty. Inti Creates - the developer behind, Bloodstained: Curse of the Moon, Azure Striker Gunvolt, Blaster Master Zero, and lots of Mega Man games - returns with the latest chapter in the ongoing Gunvolt saga: Gunvolt Chronicles: Luminous Avenger iX. 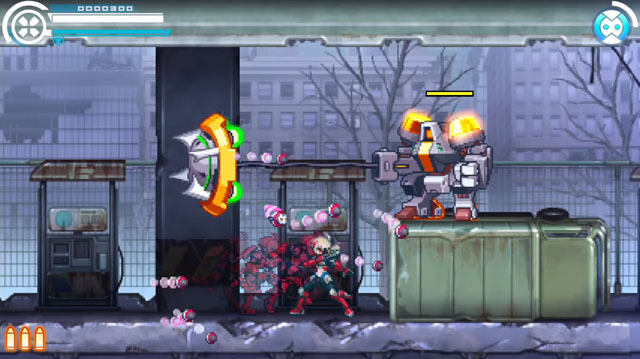 The game focuses on the exploits of Copen, who is the arch rival of Gunvolt, the hero of the main game series. Similar to the Blue Bomber, Copen is able to copy abilities from his defeated foes and use them in combat. Copen is able to move quickly around the environment and tag enemies, after which he can unleash a barrage of missiles, and he also makes use of a gun and electrical attacks. The game is coming to Switch but does not yet have an announced release date. Developer Yacht Club Games has announced via their website that the upcoming expansions to Shovel Knight - entitled King of Cards and Showdown - have been delayed by several months. King of Cards stars King Knight in a prequel to the main game, and Showdown allows up to four players to pick their favorite heroes or villains to fight each other and tackle some other game modes. The delay is promised to ensure top quality for the new expansions (the Plague of Shadows and Specter of Torment expansions were both excellent) and to complete the Switch and PS4 physical editions. All of these expansions are free to owners of Shovel Knight: Treasure Trove except 3DS and Vita versions where Showdown will be a standalone release. This will also impact the amiibo 3-pack tie-in that includes the stars of each expansion: Plague Knight, Specter Knight, and King Knight. Unruly Heroes, from Magic Design Studios (game site), is an action-platformer for a single player, or up to four players via local co-op, inspired by the famous Journey to the West, which has been loosely used as the basis for numerous video games in the past, including Capcom's SonSon and Ninja Theory's Enslaved: Odyssey to the West. The game features four (unruly) heroes dashing through beautifully detailed platforming environments and engaging colorful enemies and bosses in melee combat, and each of the characters has different movement and fighting skills, which are emphasized through fluid animations. Players can go it alone, swapping between characters to make use of their special abilities, or team up for 4P cooperative combat. The game is now available for PC via Steam, Switch via eShop, and Xbox One via Microsoft Store, and is also planned for release on PS4. Check our coverage here. Bombservice is the studio behind the Momodora series. 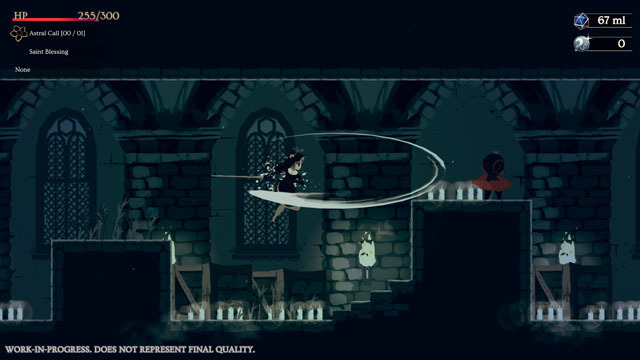 Momodora 1-3 were all pretty sweet, but the developer really hit his stride with the series prequel, a dark and engaging metroidvania entitled Momodora: Reverie Under the Moonlight. And now, the studio has returned with Minoria, a spiritual sequel to the Momodora series that casts off its chunky visuals in favor of a smoother HD presentation, while offering a similarly dark world with action focusing around melee combat and magic spells. Set in an entirely new universe, the game stars Fran and Semilla, sisters who work as missionaries on behalf of the church as they work to protect the commoners from heretical witches... although the sisters make use of spellcraft themselves. The game is coming to PC later this year. One Step From Eden, from Thomas Moon Kang, is heavily inspired by the combat sequences in the Mega Man Battle Network series, which featured Mega Man facing off against evil robots on a 3x3 grid, while his enemies stood on their own 3x3 grid, and players had a deck of chips that they cycled through to perform various attacks, all the while moving around the grid to avoid incoming fire, and some chips allowed the player to alter the playfield. 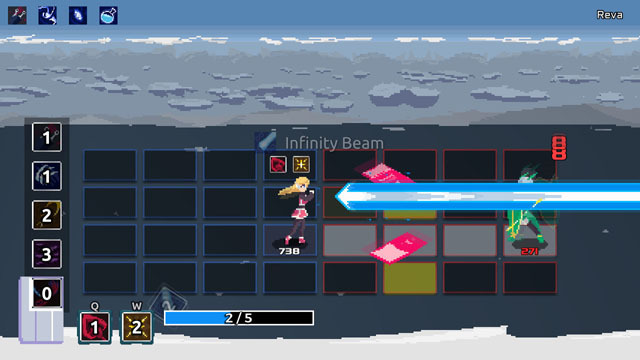 One Step From Eden is also a deckbuilding action-strategy game featuring eight playable characters, dozens of enemies, and more than 100 spells and game-altering items. The player and his enemies are each regulated to their own 4x4 grids, and they cycle through spells, dodge attacks, and attempt to deal damage in fast-paced battles. Players can also take part in 2P action with local co-op and versus modes. The game has a roguelike structure with procedurally generated content, encouraging multiple playthroughs, and also offers multiple endings. 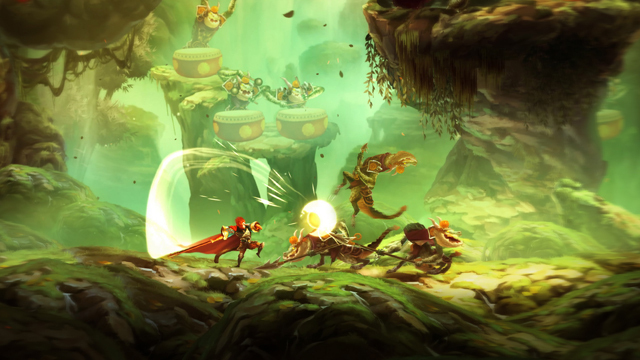 The game is coming to PC and Mac in this summer. A demo is available on Itch.io. Klaus, from La Cosa Entertainment, was released on PS4 in 2016, but just recently arrived on PC as well. 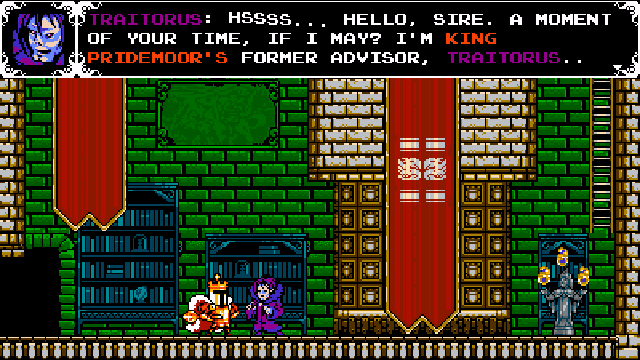 The game features a fellow named Klaus, or at least he believes that's his name. The protagonist awakens with the word "Klaus" written on his arm with no idea of whom or where he is. 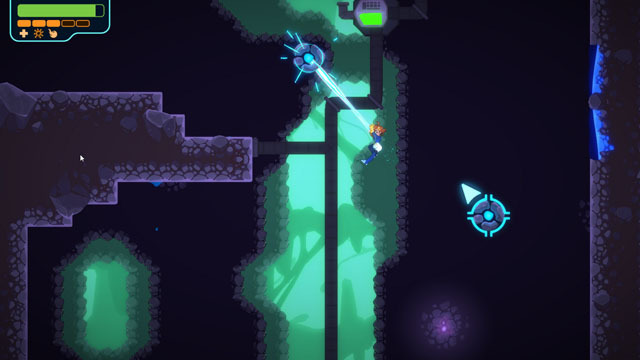 The player controls Klaus but can also independently manipulate objects in the environment, which Klaus notices... and he makes comments to the unseen player who appears to be helping him. Later, Klaus meets a brute of a man named K1, who appears to be a giant mutant version of himself. 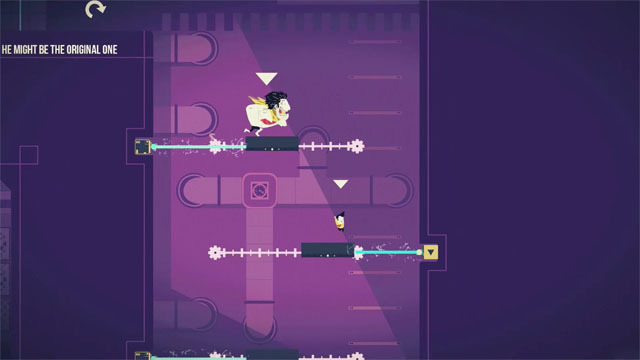 The player then assumes control of both characters - simultaneously or separately - to complete puzzle-platforming challenges and open the way forward. Through the course of the game, Klaus questions his very existence, the nature of the player, and the actions of his past. The game is available on PS4 via PSN and PC via Steam. Check our coverage here.